In this lesson, we will learn how to estimate the multiplication of numbers including decimal numbers and real-world problems. Nada’s shower uses 7.8 litres of water per minute. By rounding the number of litres to the nearest whole number, estimate how many litres she will use if her shower lasts 9 minutes. 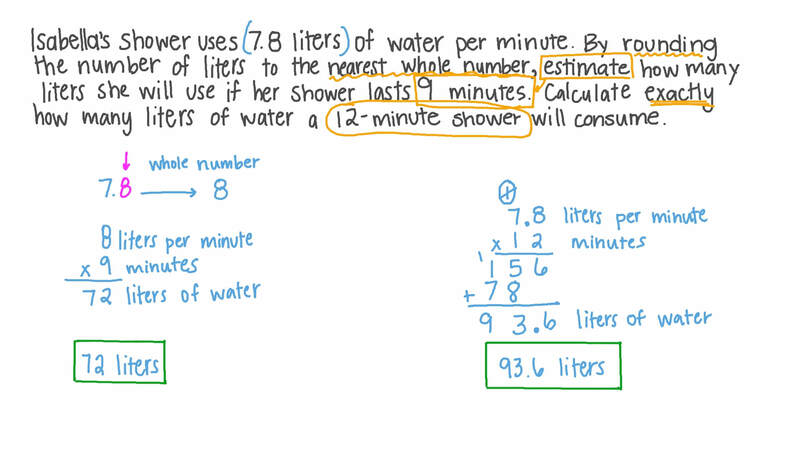 Calculate exactly how many liters of water a 12-minute shower will consume. The average person blinks about 900 times an hour. By rounding the number of hours in a day to the nearest ten, estimate how many times a person blinks in a day. Is this estimate more or less than the actual number of times a person blinks in a day?